The JumPack XL H2O is Cobra’s most versatile and powerful portable power source and jump starter yet. It enables you to jumpstart your car, truck, RV or marine engine and charge your mobile devices in all weather conditions. It is designed to jump start marine outboards, large V8 gasoline and diesel engines direct-from-the-battery or from the 12V port, and it is compliant with the latest safety UL standard. 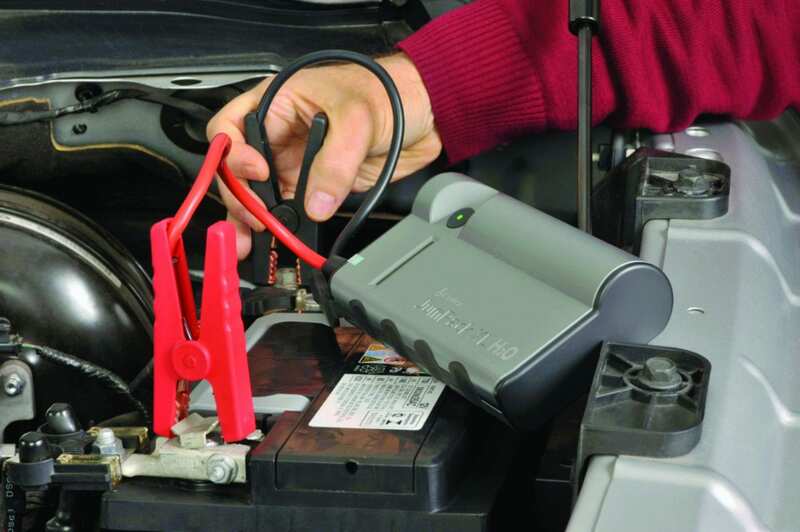 Most jump starters only work with cables connected to the battery. The JumPack can also jump a battery via the 12V port inside the vehicle, which means the user can stay safely inside the vehicle while the battery charges. The rugged and waterproof design makes it the perfect portable power device for any adventure. This compact unit is lightweight and powerful, with a lithium-cobalt battery that holds a charge longer and is smaller than traditional jump starters. An easy to view tri-color LED indicates the status of the JumPack and when it’s safe to start the vehicle. It runs its own self diagnostics to make sure the cables are attached properly, and if not, the JumPack will not allow itself to be used. This protects the user and the vehicle. Dual 3 Amp USB ports allow for rapid charging of two portable devices simultaneously, and it has a built-in super-bright LED flashlight, strobe and SOS LED. The unit includes jumper cables with clamps, a 12-volt charger cable, AC charge adapter and a neoprene carrying case.